If you want some more ideas or need help getting started with online business I recommend checking out Pat Flynn. His podcasts are what gave me the motivation to start this blog and he has a TON of content on his site, Smart Passive Income, that can help you get started. The very first thing you should do if you want to make some money online is start a blog or website. Seriously. You can make a free blog or go crazy and buy a domain, host, and install WordPress. Either way - get the ball rolling. 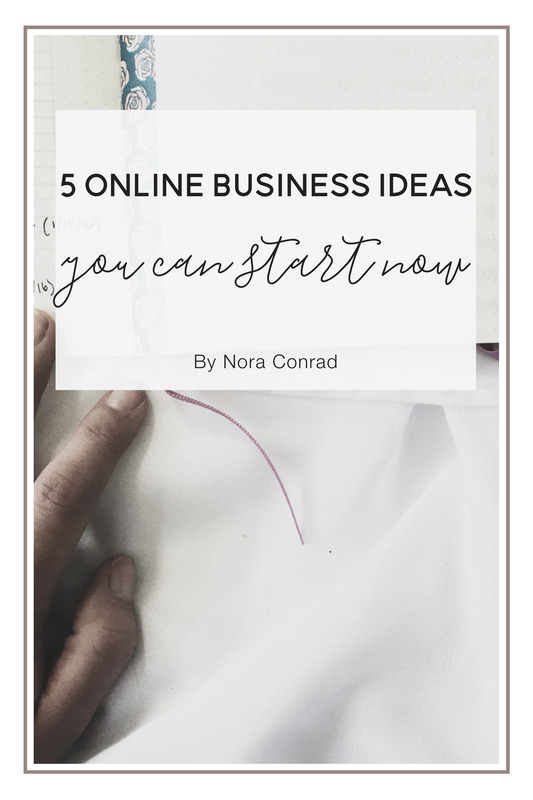 Making money from a blog can take longer than most other options but it's also the most steady stream of income and eventually the most passive. Post a few times a week (good content)! Offer your readers something they can't find anywhere else. Host giveaways and have free printables or a free eBook. Add images to your posts so your readers can pin them and help spread the word. When you've got the ball rolling you can start with the most common ways to make money from a blog. Affiliate Links, Google Adsense, Sponsorships, Sponsored Posts - You've probably read something about all of these. I used Google Adsense on my blog and Youtube channel for almost a year before trying anything else. I didn't make much but I made enough to cover my expenses. Sign up for ShareASale, they are the simplest affiliate website I've worked with, and I've tried A LOT. They have thousands of clients and a ton of banners for each company. They're just perfect for someone getting started. If you are creative, can make crafts to sell or even create a budget template in PDF form you can open an etsy shop. You can sell both physical and digital products on Etsy and it's super simple to do. Etsy is extremely easy and simple to use. Go here and sign up or log in (plus if you use that link, you'll get 40 free listings). You don't have to pay any fees until you have products published in your shop. Then every listing is $0.20. It's cheap and millions of people use it so your product can get found. Personally I am working on creating more digital products. The thing that's great about them is they are passive income. All you have to do is make the product, list it on etsy and keep it updated. As long as you're promoting your listings and sharing them on social media you'll be selling your product. Super simple. These are my least favorite of the ways to make money online. Mostly because you can't make much money off of them. However they are the easiest way to make money. You can join survey sites where you only take surveys, like Opinion Outpost. Or you can sign up for sites where you can take surveys, watch videos, shop and earn points in other ways, like CashCrate. For survey sites it's best to sign up for 2-3 at a time and work on the tasks while watching tv, in waiting rooms, or while working out on a stationary bike (or something like that). They take time but it requires very little work. Besides blogging, I think this is my favorite way to make some extra money. BlogHer and Influenster are the two examples I know of. So we'll start with Influenster. You make an account at influenster, connect all your social media accounts, and fill out a couple surveys. From there you can review products you use, and in return you can earn VoxBoxes. Basically they are free samples that get sent to you in the mail. For example I got a Victoria Secret Vox Box that came with a free sports bra, capri leggings and 10 25% off coupons. The only trade off is that you are asked to talk about the box on your social media accounts and fill out a short survey at the end of the campaign. The more active you are on their site, the more boxes you can receive. This is perfect if you have a large social media following. BlogHer is set up more for bloggers but recently they started a section just for social media accounts as well. I just did a campaign where I had to tweet 8 ads over the period of 1 month. You follow the guidelines and get paid $50. Again, this is great for people who have a large social media following. Blogher is a little more exclusive than Influenster. You have to apply for each social media account and they give you different campaigns based off your profile and how many followers you have. Either way it's an easy $50. If you have any idea how to design, code or be a virtual assistant, there are a ton of options for you. If you are looking for a more long-term commitment Elance is the best option. You make a profile, apply to jobs and get paid. Some of the jobs on there can be for a full year, or just one project. You can make a free account or buy a pro account for more options. They also have a great affiliate program. Fiverr is a more laid back kind of site. Everything they sell is $5 (hence the name). You can easily add your own products and services. It's free and easy, the downside is that it takes awhile to get customers to notice you. You'll have to do some marketing work. 99 Designs is by far the best option for graphic designers. From business cards to full websites, you chose a project you want to work on and then fight for the open spot with other graphic designers. The project creator chooses their favorite designer and hires them. It's simple to use, and as long as you have some skill, you'll be able to earn money. They also have a great affiliate program. There are a million more sites like this, but these three are all site I've tried and had success with. I have even used them to hire some help and I recommend all three.